Avolites latest addition to the console is the Avolite Azure Shadow. The console is a variation of the highly popular Avolite Azure Shadow which has enjoyed success in a variety of applications, particularly clubs and time-coded environments. The Avolite Azure Shadow features all the facilities offered by the Azure Touch Panel (the original Azure) with the additional functionality of the 'Schadow switch' live playback buttons that have always been integral to Avolites' consoles. Avolites have listened to customer feedback which revealed that some users would prefer the conventional Schadow switch rock 'n' roll buttons as opposed to the waterproof membrane of he Avolite Azure Shadow. The small but immensely powerful and highly cost-effective Avolite Azure Shadow can control a mixture of up to 200 intelligent fixtures and 200 dimmer channels over its 4 DMX lines giving 2048 DMX channels. It can run 20 separate Sequences of Environments simultaneously and has 50 direct access memories and chases per page with 10 labeled playback pages. The console offers simultaneous control of 200 mixed intelligent fixtures and 200 dimmer control channels. It also has the power to run 20 separate Sequences or Environments at the same time! Further to aid programming of complicated sequences there are 200 pre-loaded moving light 'shapes'. These include complex waves, fans, ballyhoo's, shutter and iris sequences. New shapes and patterns can easily be created using the revolutionary Avolites Shape Generator. There are several standard features that would normally only be found on consoles costing many times more; these include Align, Flip, Fan and full 3D tracking. Further value is added by the 3½ inch Floppy Disk Drive and the Colour VGA Monitor Output - which are both fitted as standard. In addition to the 500 memories or chases, the Avolite Azure Shadow includes 20 Environment programmes. Each of these may contain multiple sequences, running from different sound-to-light inputs as well as static memories and environmental control (e.g. neon, house lights, bar lights, etc.). The Environment programmes may be controlled from the internal clock, internal Time Scheduler or an external time code input. In keeping with the Avolites tradition of "hands on" rock 'n' roll control, the Avolite Azure Shadow is fitted with 10 submaster Playback Faders and two ultra-smooth metal shaft Optical Encoders. To ensure the Azure Shadow is particularly applicable to theatre productions, several pertinent functions are included to fine-tune the console for theatre use. These are 'Record Live', 'Live Time', 'Next Time', 'Review Cue' and 'Jump To (Cue Number)'. A number of different configurations are available to suit your particular requirement. The standard console is designed to drop into a 19 inch rack system or control booth counter top. The console can also be configured for stand-alone use, complete with ergonomic armrest and surround. Alternatively, the Azure Shadow can be supplied as a fully flight-cased Control System with integral Graphic Tablet and remote control. Avolite Azure Shadow can also be used in conjunction with the award winning Graphics Tablet and Avolites Stager Visualiser to produce an unrivalled control system. 200 dimmer channels - with soft patch, response curves and HTP control. 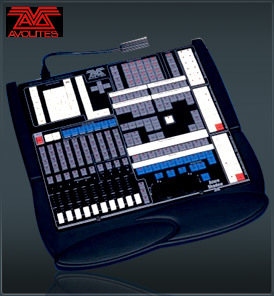 Full connection to the Avolites Stage Visualiser with patch import and automatic follow spot training.